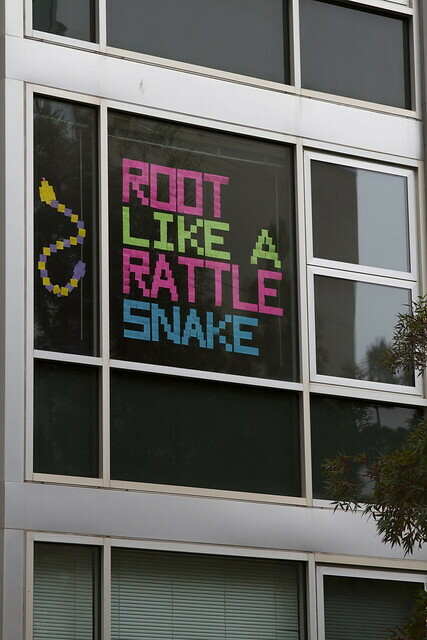 Just days after writing the famous “Mean Girls” catch-phrase “You go Glen Coco” with sticky notes on their dorm room window, three SF State roommates were shocked to find out their window art struck a chord with students, topping out at 187 likes on an SF State Facebook page. These dorm window displays have created a forum where students can communicate and strengthen the bonds forged in on-campus housing. From the first night when the three roommates — Emma Lindberg, Veronica Macias and Michelle Withrow — put up the “Mean Girls” phrase, they recalled hearing people yell up to their window, often repeating the phrase or variations such as, “You go Village C” and saw multiple people stopping to take pictures. Another set of residents in The Village at Centennial Square has already changed their art three times this semester after experiencing a new way to meet peers across the way. Angel Suarez, a 17-year-old undeclared freshman, was visiting his friends’ dorm when he noticed that the window across the way put up a reaction to their sticky note design. “We were setting up Mario (on the window) when people in another window wrote ‘Hey,’” Suarez said. Suarez’s friends wrote “hello” back, and after further dialogue, headed over to the dorm that was interacting with them across the way. Weinberg said that some of her peers on campus recognized through conversation that her dorm had the Pac-Man window. “It’s kind of a way to meet people even though it’s kind of roundabout,” Weinberg said. Russell Crespen, president of the residential housing office, said that as far as he knows, there are no restrictions to having window art on campus. He enjoys it when students put sticky note art on their windows. Since posting their “Mean Girls” quote, Lindberg, Macias and Withrow established a connection with some upstairs neighbors, who put “so fetch” on their own window. Although the neighbors don’t really know each other, 19-year-old resident Hanna Wolff said that they have since established a connection. “We have no idea who the people are downstairs, but it has kind of brought us together,” Wolff said. Lindberg, Macias and Withrow have already changed their window art to a phrase from the HBO series “Girls” and have two sticky notes full of further ideas.